On March 21 the Moderate Resolution Imaging Spectroradiometer or MODIS instrument aboard NASA's Terra satellite provided a visible image of Trevor. Trevor hadn't strengthened enough over water yet to develop an eye in visible imagery, but the center was surrounded by powerful thunderstorms. Microwave satellite imagery suggests that an eye has re-developed. At 11 a.m. EDT on March 21, (12:30 a.m. AWST Australian Eastern Standard Time on March 22), maximum sustained winds near Trevor's center were near 68 miles (110 kilometers) per hour. Trevor was a strong tropical storm. Trevor was located near 13.9 degrees South latitude and 140.6 degrees East longitude, about be 84 miles (135 kilometers) west southwest of Aurukun and 283 miles (455 kilometers) east of Alyangula. 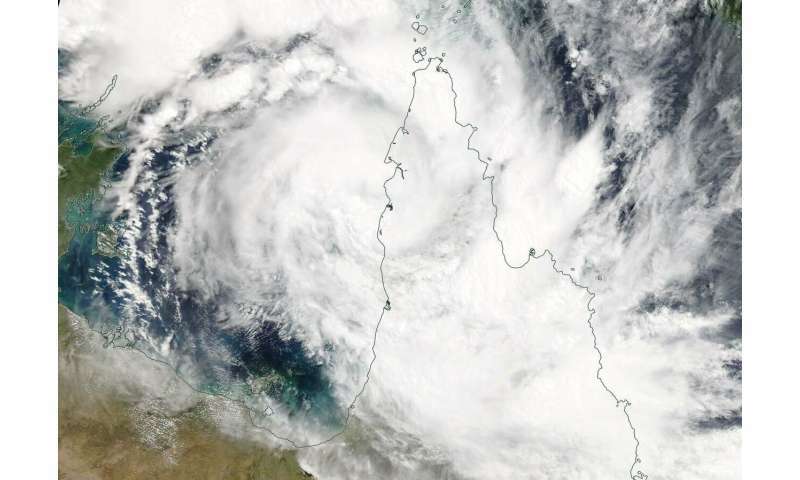 Tropical Cyclone Trevor is located over water in the eastern Gulf of Carpentaria. ABM forecasts that "Tropical Cyclone Trevor will intensify further as it adopts a more general southwest movement across the Gulf of Carpentaria tonight and during Friday. It is likely to cross the Northern Territory coast during Saturday as a category 4 severe tropical cyclone." Trevor is expected to make landfall near Borroloola.